As we age, repeated contraction of our facial muscles can cause the appearance of undesirable lines and wrinkles. We may see “frown lines” between the brows, “worry lines” on the forehead, “squint lines” around our eyes, and “bunny lines” on the nose. Fortunately, Botox is a very effective treatment to minimize the appearance of these lines, and even help to reduce the formation of new ones. Botox is a protein purified from bacteria that works by temporarily blocking the signal sent from nerves to muscles, telling them to contract. When the targeted muscle relaxes, the wrinkles overlying it soften, smoothing out the lines and giving the skin a more relaxed, youthful appearance. Wrinkles often begin to fade away within just a few days after the procedure. Botox injections use tiny needles, causing very little discomfort. A treatment usually only takes a few minutes, and there is no downtime or recovery period. When administered by an experienced medical professional, the benefits of Botox injections should typically last for 3-4 months. With continued treatments, your results may last even longer. One of the most common signs of aging is the loss of volume from the face, leading to the appearance of wrinkles and slightly sunken areas on the face. Fillers offer a safe, effective way to rapidly reverse some of these signs of aging, without having to undergo an invasive surgical procedure. Fillers can smooth and restore fullness in many areas of the face. There are many options for fillers on the market. Many of them, like Belotero Balance, and Juvederm, contain hyaluronic acid, a substance naturally found in skin. Some fillers are meant to be used to fill fine lines, such as those seen around the lips, while others are meant to be injected more deeply into the skin, to help restore lost volume. The benefit from fillers is visible immediately after the procedure, and no downtime is usually necessary. Depending on the treatment area and the product used, the benefits should last for six months to two years. Your provider at Chapel Hill Dermatology, P.A. will do a comprehensive consultation and then advise you of which treatment options would be best for you. Loss of elasticity, or sagging, of the skin is one of the most common complaints of aging. Until recently, patients had few non-surgical options for tightening the skin. Forma offers a safe, comfortable, non-surgical treatment that can tighten, lift, contour, and firm up sagging skin. Using state-of-the-art technology to generate radiofrequency energies that target the deep layers of the skin, Forma can tighten the skin while also inducing new collagen formation. Forma treatments can be done for all skin types, and are effective for tightening the skin on the entire face, neck, upper arms, abdomen, and thighs. Typical sessions last only 20 minutes and are painless, often reminiscent of a hot stone massage. Most patients require six weekly sessions to get the maximum benefit. Best of all, there is no downtime, which means you can immediately return to your normal daily activities after each treatment. Fractora treatments can be used to treat the entire face and neck (including eyelids), helping to restore your skin to a more youthful appearance. This state-of-the-art, minimally invasive technology combines micro-needling and radiofrequency pulses to both tighten existing collagen and induce the formation of new collagen in the skin. The result is a reduction in both fine and deep wrinkling, diminished sagging, and a smoother overall skin tone and texture. Typically, two to three sessions, spaced four to six weeks apart are needed for maximal benefit. Most patients have minimal downtime and can return to their normal routines within just a few days. Noticeable improvement can often be seen immediately, but typically, it takes two weeks to see dramatic benefits. The skin will continue to improve for three to six months after treatment. Unlike other treatments, which typically must be repeated every few months, the benefits of Fractora are expected to last for five or more years. Many people who have unwanted hair have struggled to find good, effective treatment options. Chapel Hill Dermatology, PA is pleased to offer Diolaze hair removal to our patients. Diolaze is a state of the art laser that is safe, gentle and effective. Diolaze’s large treatment head makes it possible to remove unwanted hair quickly and conveniently, even over large areas. Due to normal hair growth being cyclical, it typically takes four to six sessions for permanent hair reduction in the treated areas. Diolaze works best when treating darker hair in fair-skinned people. For patients with light blond, red, or gray hair, where no laser technology works very well to remove hair, our office also offers traditional electrolysis, which is effective in all skin types. 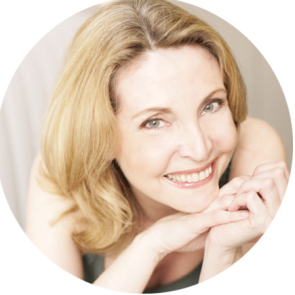 Our board-certified and licensed electrologist uses the latest technology to ensure that you will get the best results with the greatest safety. If you are interested in learning more about treatment options for hair removal, we offer free consultations. Our providers will do a careful evaluation of your needs and review your best treatment options. Persistent facial redness is most commonly the result of either chronic sun exposure damage, or from having rosacea. The presence of superficial blood vessels may appear as a “ruddy” complexion, visible blood vessels or blushing. Patients often notice that their redness is made worse by heat, exercise, spicy food or drinking alcohol. Chapel Hill Dermatology offers two effective treatment options for these superficial blood vessels. A vascular laser can be used to target discrete blood vessels on the face. The light energy from the laser penetrates the small blood vessels, where it is converted to heat that selectively damages the lining of the vessels, causing them to resorb. When larger areas of redness need to be treated on the face, neck, or chest, we offer next-generation Intense Pulse Light (IPL) therapy, called Lumecca, whose large spot size makes it possible to treat broad areas efficiently and effectively. Your provider will discuss your specific needs and can make recommendations on which treatment is right for you. 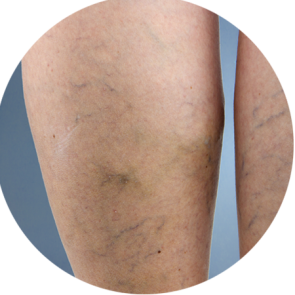 Visible, small, superficial vessels on the legs, called “spider veins” or telangiectasias, are best treated by sclerotherapy. This therapy involves using tiny needles to inject an irritating substance into unwanted vessels. In response to the irritation, the treated blood vessels clot and are slowly absorbed by the body. 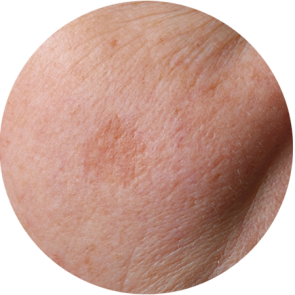 Sun exposure can cause flat brown spots, called lentigines, (also commonly known as “age spots” or “liver spots”) to appear on the skin. The direct result of ultraviolet sun exposure and damage accumulated over the years, lentigines are most commonly seen on the face, arms, and hands. For most patients, so-called fade creams prove to be too slow and ineffective in treating lentigines. Chapel Hill Dermatology, P.A. is pleased to offer a new, more powerful form of intense pulse light (IPL) therapy, called Lumecca, to treat lentigines. Unlike older IPL therapies, Lumecca’s broader wavelengths of light more effectively target the darker pigmented spots in the skin. As a result, significant improvement can often be seen after just one treatment, although some patients may require up to three treatments for maximal benefit. Recovery time is short and most patients can return to their normal routines in just a few days. Until recently, patients had few good options for improving the appearance of acne scars and stretch marks. Chapel Hill Dermatology, PA is pleased to be able to offer Fractora, a state of the art technology that can be used to treat these problems. Fractora is a minimally invasive technology that uses micro-needling and radiofrequency pulses to tighten and smooth the skin, reducing the appearance of acne scars or stretch marks. Fractora treatments have minimal downtime and most patients can return to their normal routines in just a few days. In most cases, the benefits will be noticeable after two weeks and will continue to improve for up to three months after treatment. 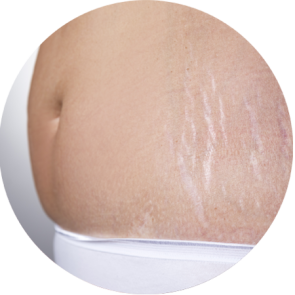 Depending on the amount of scarring or stretch marks that you have, you may need up to 3 sessions spaced 4-6 weeks apart for maximal benefit. Our providers will be happy to evaluate your skin and discuss whether you would be a good candidate for Fractora treatments. If you thought nothing could be done for acne scars and stretch marks, you now have an effective treatment option with Fractora!